Looks that impress. Performance that endures. Where form meets functionality, there's Symmetry Signature. Symmetry Signature Railing is the ideal balance of great looks and lasting performance. The soft satin finish is elegant yet incredibly durable. A sculpted top rail adds classic style, while hidden hardware keeps the look clean and uncluttered. Three rich colours and two baluster choices create multiple design options. Best of all, the smart composite construction and protective bonded cap layer eliminate work and worries. Sit back and enjoy the view. Premium composite with a permanent surface finish for lasting good looks. Clean with soap and water or mild household cleaners. Created from recycled content, our composites are toxin-free and produced using sustainable methods. 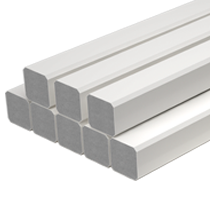 Symmetry Railing is available with bevelled square balusters in both 749.3 mm and 901.7 mm lengths. Symmetry Railing is available with a black aluminium baluster. 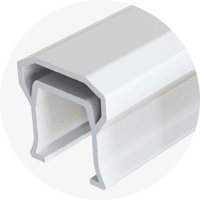 Available in 749.3 mm and 901.7 mm lengths for line sections, and 762 mm and 914.4 mm for stair sections. Distinctive bevelled 12.7 cm x 12.7 cm matching matte finish post sleeve. 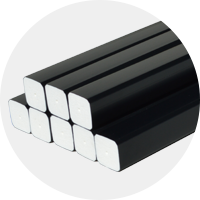 Available in 99.1 cm, 1.14 m, and 2.74 m lengths. 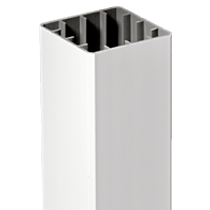 Fits over standard 10 cm x 10 cm wood post or the Fiberon Post Sleeve Surface Mount Kit. 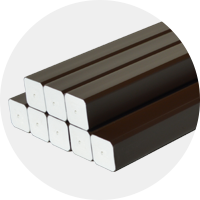 Corrosion-resistant aluminium with powder-coated finish. Available in packs of 20 balusters. Diameter is 19 mm. 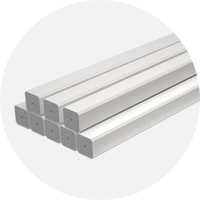 Available in 74.9 cm lengths and 90.2 cm lengths for 91.4 cm and 1.07 m railing line installations. 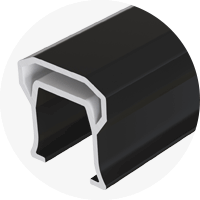 Available in 76.2 cm and 91.4 cm lengths for 91.4 cm and 1.07 m stair installations. 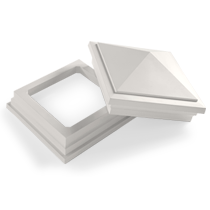 The Symmetry crush block assembly includes a short section of Symmetry 3.2 cm square baluster, one adapter, and three screws. The adapter works with both line and stair applications. Hidden corrosion-resistant hardware. All Symmetry rail kits come with hidden hardware for line and stair installation. 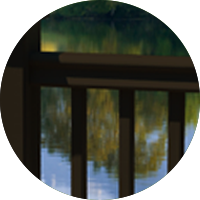 Symmetry Signature Railing is backed by a 25-year limited, performance warranty. See details. 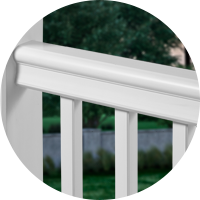 How is Fiberon Symmetry Signature Railing sold? Each section includes the top and bottom rails, balusters, crush bocks and holders, and the mounting hardware. There are three color options (Tranquil White, Serene Black, and Simply Brown) and two baluster options (beveled composite balusters or round black metal balusters). Post sleeves, post caps, and post skirts are sold separately. What baluster styles would work with Symmetry Signature railing? Symmetry Signature railing has matching solid, beveled-edge, square balusters and black aluminum balusters. How do I clean Symmetry Signature Railing? 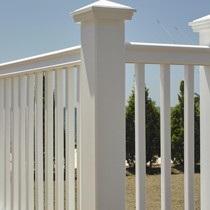 Use soap and water or mild household cleaners to clean your Symmetry Signature Railing. Can I paint Symmetry Signature Railing? 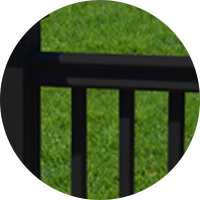 You can paint Symmetry Signature railing; however, the durable PVC finish enables the railing to withstand the elements without ever needing paint. If you do decide to paint your railing, consult a paint specialist to ensure the proper paint is used.